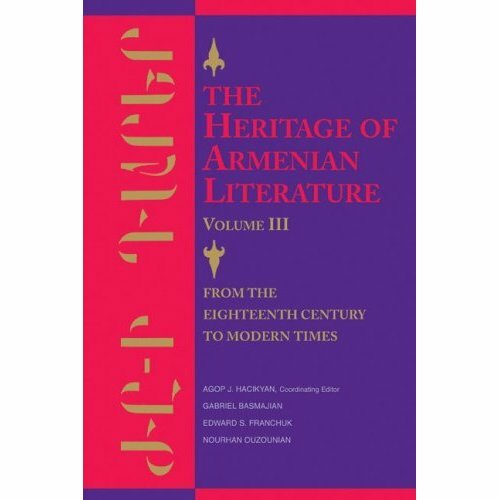 The Heritage of Armenian Literature, edited by Agop J. Hacikyan, Gabriel Basmajian, Edward S. Franchuk and Nourhan Ouzounian, is a three volume set that traces the anthology of Armenian literature. Highlighting periods of Armenian literature, from the oral tradition to the golden age to modern times, The Heritage of Armenian Literature contains Armenian literary masterpieces that have been translated into English in order to preserve the literary traditions of Armenians. The talented writers featured in these volumes include literary giants who have contributed significant value to Armenian culture and history, including Yeghishe, Movses Khorenatsi, Grigor Narekatsi, Mkhitar Gosh, Mesrop Mashtots, Sayat-Nova, Hakob Paronian, Siamanto, Daniel Varuzhan and Yeghishe Charents, among many others. Not only does The Heritage of Armenian Literature compile the biographies and literary pieces of each of these authors, it also provides historical context and covers the development of Armenian literature — one of the oldest in the world — over the past 3,000 years. The Zohrab Center’s library collection contains over 20,000 books and resources ranging from Armenian literature, history and religion to Armenian newspapers, journals and periodicals. Each week, one of the center’s holdings will be highlighted to familiarize the general public about the contents of the Zohrab Center.